The Druids of this world are fighters and philosophers, not healers. They use dark and mysterious cosmic power to defend their Realm. They can call on the power of the moons and even the stars themselves to attack enemies. 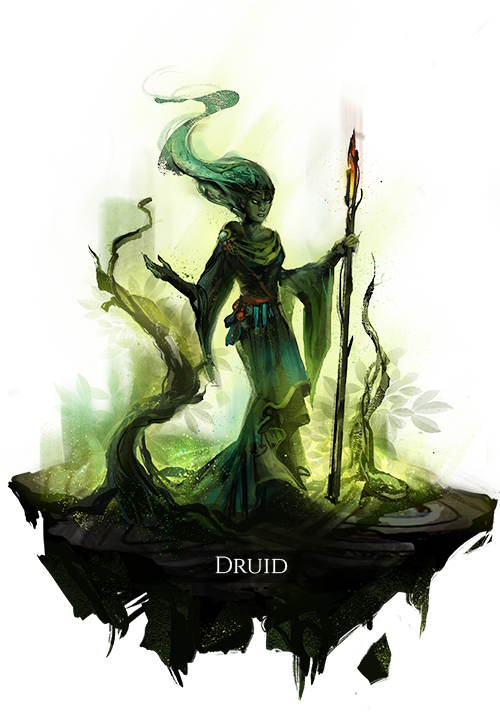 One of the Druid’s abilities is to call on another member of their Realm, or even themselves, to sacrifice their lives for the good of the Realm. This same ability can be used on members of the other Realms, albeit a lot less willingly. The soul is everything, the body nothing. Deals high void damage and increases the target’s panic rating. A large, slow-moving projectile that ignores gravity and tracks toward a target. As this projectile moves, it applies the effect of the rune it is combined with to nearby enemies, at reduced power. A channeled shape that generates an expanding bubble around the user, applying the effects of a rune to targets that come into contact with the surface. The bubble remains for a moderate duration if the channeling time completes without interruption, adding its effects to allies’ magic projectiles that pass through it, which consumes a portion of its remaining power. A slowly expanding wave of unconstrained energy in all directions from the location of the user’s ally target that applies its effects to targets in a large area and extends its reach with each target affected. A channeled ability that affects the nearest enemy or ally target, or the user themselves if no target is selected. Focuses a swarm of incorporeal tendrils toward the target’s body, lashing at it and dealing void damage to all parts of their body for a long duration as long as they remain in range. If the target dies while affected by the tendrils, the void energy is absorbed into their body and emanates an effect over a large area, with power divided among the Druid’s allies affected. This effect significantly increases spirit resistance and reduces the blood cost of abilities, as well as adding bonus void damage to physical attacks. If the user dies within a long duration after activating Cosmic Doom, the user’s body cracks open. This reveals a grotesque void rift, which has gathered power from magic abilities used by enemies in the vicinity of the user over the course of Cosmic Doom’s duration. The rift then erupts, expelling horrific waves that ripple out as an aura and distort the effects of subsequent magic abilities used by enemies it has gathered power from, within range. Affected enemies have their magic abilities deal an equal amount of void damage to themselves as they deal damage to enemies or healing to allies. This consumes the power of the rift with each ability used until it is all expended, or until the rift expires after a long duration. If the rift survives its full duration, it explodes on expiration, inflicting its remaining power as void damage to each enemy over a large area and corrupting the ground for a long duration, inflicting void damage to enemies as they move across it.